On some Mazda vehicles, a sulfur smell or rotten egg odor may be noticed coming from the exhaust system. The odor is usually noticed after a cold start, fast idle, extended periods of idling and full-throttle acceleration. The sulfur smell is not an indication of an engine concern and will not cause reduced driveability or durability of the engine or any of its emission components. The sulfur smell or “rotten egg” odor is caused by high amounts of sulfur in the gasoline being used in the vehicle. Sulfur is normally eliminated during the refining process, but the EPA regulation of sulfur in gasoline differs from state to state. Vehicles using fuel containing high amounts of sulfur will most likely emit sulfur smell from the exhaust system. When high sulfur fuel is burned, there is a chemical reaction in the catalytic converter that causes the sulfur to oxidize. As the vehicle is driven, the oxidizing reaction odor in the converter will decrease with mileage and age. 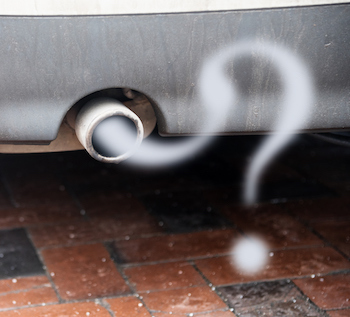 Replacing the catalytic converter will not eliminate the sulfur smell and replacement will just extend the period of time needed for the converter to “age,” allowing it to reduce sulfur smell to an acceptable level. 1. Switch to a different brand of fuel and drive the vehicle for at least 100 miles. Monitor the decrease or increase in the sulfur smell. 2. Do not add any type of “fuel additive,” as this could add sulfur to the fuel and cause/increase the odor. 3. Try to avoid extended periods of short-trip driving or aggressive acceleration. 4. Request information from your local fuel dealers on the amount of sulfur in their gasoline. Advise your customers to try to use fuel containing the lowest amount of sulfur.